Prototype: Belgian State Railways (SNCB/NMBS) type M2 A5B5, 1st and 2nd class. Model: The car has separately applied window frames. 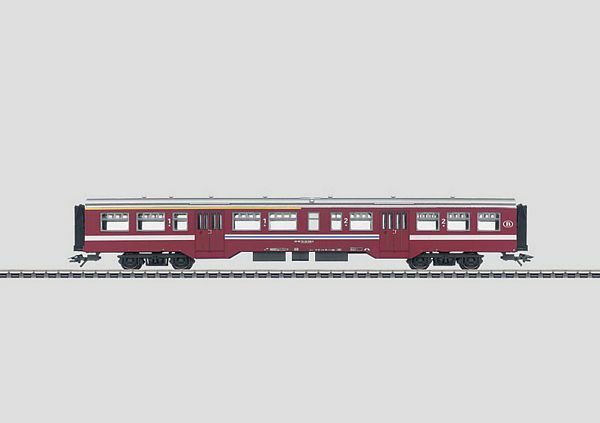 The car comes in a crimson color scheme with white stripes as the prototype looked at the end of Era IV and the beginning of Era V. This car can be retrofitted with the 7319 plug-in current-conducting couplers or the 72020 working close couplers that can be uncoupled. Length over the buffers 27.5 cm / 10-13/16. DC wheel set 4 x 70 0580.